I honestly cannot believe today is the first day of October! One of my favorite things about fall is being able to wear boots; I am from Tennessee after all. It hasn’t been cold enough where I live to break out boots yet; I am still enjoying the warm weather for as long as I can! For me, cozy sweaters and riding boots are synonymous with fall. If you aren’t familiar with boots finding the right fit might be a little tricky, sometimes you may need to go up or down a size from your standard shoe size. Initially you want the riding boot to be a little difficult to get on and off; when a pair of boots breaks in they tend to loosen up a little so you want to avoid buying a pair that may be slightly too large. When purchasing riding boots you want the boot to fit nicely around the calf and for your foot to fit in the boot like it would in a normal shoe. In some cases you might have someone tell you that your heel is supposed to rise up inside the boot a little when you walk; if someone tells you this ignore them, they don’t know what they are talking about. If your heel is rising up inside the boot when you walk, you will get blisters. Ideally you want the ridding boot to fit comfortably and look sleek and stylish. Here are a few of my favorite ridding boots for the fall! Click on the picture for the links. What better way to usher in October then with a pair of riding boots! Happy Fall Season! Love your picks! Riding boots are my favorite item for fall!! 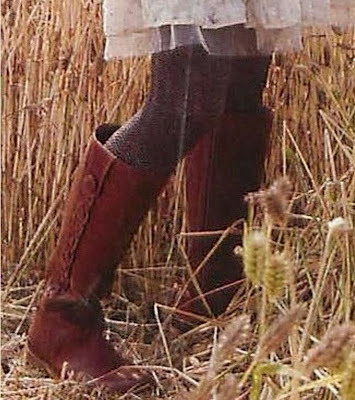 Riding boots are my favorite fall items too, hands down! Love the riding boots really need some :)! I love riding boots, they look great with jeans or dresses! Love the boots! Great picks! That is so exciting, you will love riding boots! I wear mine all the time in the fall and winter! I agree. Glad to hear you enjoyed this post! I love the two-toned Tory Burch ones--such a great mix of color and texture! I love Tory Burch riding boots, they always fit perfectly! Love your picks, my riding boots are packed away with all my winter things but I think its time to bring them out now that October is here! I'd love a pair of Tory Burch boots one day, definitely worth the investment. I can't believe October is here already! October really is the perfect month for riding boots! Thank you so much for the compliment and the follow! I will definitely stop by your blog! Why oh why are those gorgeous Tory Burch boots so expensive :( I want them oh so badly! I know exactly how you feel! I always wait till after Christmas when they have their big sale! I love boots in the colder weather. Thanks for your tips on the fit of the boots. I did buy one that definitely caused some blisters because it did rise up while I was walking. Also, thanks for your sweet comments on my blog. Have a nice day. Just stumbled on your blog. Could not agree more.....fall is all about boots and sweaters. I'm a frye junkie! But love the tb two toned........love. I love frye boots! They are such a great boot and stylish, of course! I want a lll these boots!!! I have a boot obsession!!! AHHH! I have a boot obsession as well! Great post. These boots are looking so beautiful and perfect for riding. These ideas are very useful to buy the riding boot. Thanks to sharing it.. Thanks for visiting my blog and for your lovely comment! I am happy to hear you enjoyed this post!